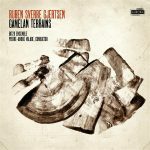 From 2008-2015 Rødland was an artistic research fellow at the Norwegian Academy of Music in Oslo, employed through the Norwegian Artistic Research Programme. Her project called Let the Harp Sound! 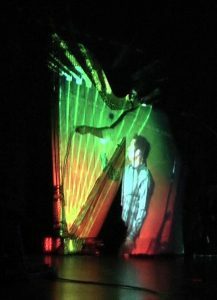 promoted and explored the harp’s possibilities in contemporary music, as well as exploring wider topics such as new roles for musicians, development of the concert format and the use of multimedia, theater and electronics. Let the Harp Sound! consisted of 40 concerts, 2 published recordings, 9 world premieres and a written document, published at Brage, that present Rødland’s reflections on her artistic process and result. The document also contains interviews with the harpists Judy Loman, Godelieve Schrama, Willy Postma and Elisabeth Sønstevold. The main result of Let the Harp Sound! was presented at a final concert in Kulturkirken Jakob in June 2012. You can watch videos from the concert by clicking here. 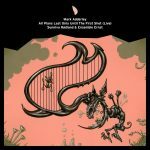 Let the Harp Sound! had many collaborators, among them the composers Simon Steen-Andersen, Henrik Hellstenius, Øyvind Torvund and Mark Adderley. The project involved established ensembles such as The Norwegian Wind Ensemble, Ensemble Ernst and Nidarosdomen Girls Choir, as well as performances at the World Harp Congress (2011), the Ilios Festival and Ultima Oslo Contemporary Music Festival. The assessment committee consisted of Prof.Anne LeBaron, Prof.Bjørn Kruse and Prof.Gabriella Dall’Olio.